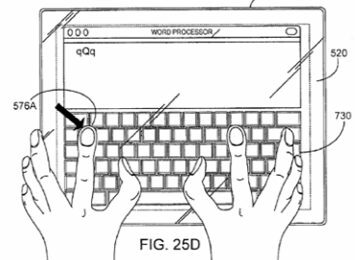 An Apple patent application published today rehashes some concepts and diagrams from 2006 patent but generates continued interest due to persistant rumors that Apple may release a multi-touch tablet Mac. Apple explains that on a tablet Mac, the buttons of a control box may be smaller than a users finger and located close together. Therefore it may be difficult for the user to make a selection directly without possibly pressing an undesirable button. To solve this problem, at least a portion of the control box would be enlarged, including the buttons therein when the user places their thumb over the control box. While we've heard rumors of a tablet Mac for years, this year we've heard claims that either a tablet or mini-tablet Mac could be coming soon.